I've been living in Yogyakarta for seven years now, but sadly, I never explore the city much. Well, I did explore, but never took the proper images of me plus the beauty of the city. So today, in the middle of finding new nest for me, I told my friend (Mr. Imam who help me taking these photos also! A big fat thanks!!) to take me to Pulau Cemeti, Yogyakarta. I've been there for million times, but as I said I never took proper images there. Okay, shame on me, I know! Thus, with a strong will at the bottom of my heart, I encourage myself to take some snaps even though the rain drops right after we arrived. Eeeeeeekkkk! Today is kind of gloomy but sunny day at the same time. That's why I chose to wear light blazer and short sleeves polo. 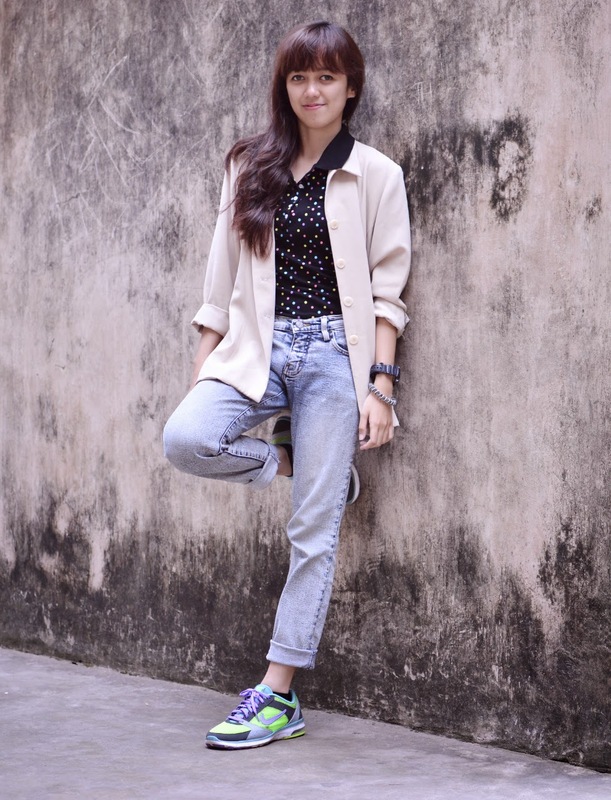 The dotted pattern makes whole outfit looks playful, and the sneakers makes it feels energizer. Don't you think so? :) And because I know it will be long day trip (well, finding the perfect nest is never easy, no? ), I worn my jeans instead of skirt (even if I was dying to wear it! LOL). I hope you guys have a great time! Now I'm gonna find my dinner. Been starving of something oily and spicy and hot. Hahahaa. I know, it sounds gross, but it's weekend people! I can get anything I want to! LOL. P.S please excuse my messy hair, since it was hot and cloudy and I couldn't help my sweats out. I didn't know how could this happen, it just did! Nice pictures! I especially love that blazer on you! Make you look so sophisticated :) I really like it! you look great! that photos are ROCK!